ABBOTSFORD – The BC Ministry of Environment plans to implement the new agricultural waste control regulation over several years, the ministry’s clean technologies director Chris Jenkins and hazardous waste senior policy specialist Mike Schwalb told the Mainland Milk Producers Association at its fall meeting in Abbotsford, October 24.
Review of the regulation, originally adopted in 1992 and last amended in 2008, began in October 2009. Jenkins told producers the new regulation aim for better clarity and enforceability, protect high-risk areas and better fit modern agricultural practices. She said the amendments are “nearly finished” and she expects them to come into force in February. Nutrient management plans (NMPs) are a key component of the new regulation but they will be phased in over time. “Farmers in the Hullcar Valley will need to create and implement them right away; other livestock and poultry producers will need them starting in 2021 and all other farmers will have to have them in 2024,” Schwalb said. Initially, the NMPs will only cover nitrates but phosphorus will be added starting in 2025. Farmers located above aquifers will have to do both post-harvest nitrate and phosphorus soil testing every one to three years, Schwalb said. Those requirements will start in 2021 for farmers above the Abbotsford/Sumas, Aldergrove, Fort Langley and Hoppington aquifers. They will start a year later in Chilliwack, Agassiz and Seabird Island. Starting in 2022, farmers will be prohibited from spreading manure in November, December and January and will have to do risk assessments if they want to spread in October, February or March. Schwalb said the risk assessments will be similar to those already required in Whatcom County. Farmers still using earthen manure storage will have to do a leak assessment by 2021 and add a liner by 2029. 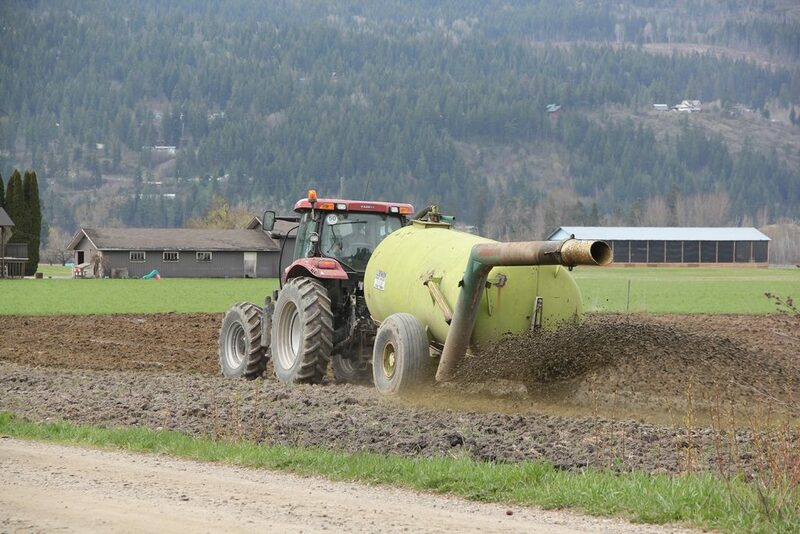 The new regulation also limits field storage of poultry manure to just seven months (nine months is currently permitted) and requires a setback of three metres from watercourses for above-ground manure spreading and 1.5 metres for injection systems. Although the BC Ministry of Agriculture will provide guidance and tools to help farmers meet the new requirements, the environment ministry will dedicate staff to enforce the new regulation. Farmers can only hope implementation of the new waste control regulation will be smoother than implementation of groundwater licensing. The province required groundwater users to license their wells as of February 29, 2016. It has given them until March 1, 2019 to do so in order to recognize their “first-in-time, first-in-right” priority usage. This is an extension from the previous deadline of December 31, 2018. After one producer noted he had applied in November 2016 and had yet to receive his licence, BC Ministry of Forests, Lands, Natural Resources Operations and Rural Development authorization specialist Tara Despault acknowledged the approval process is proving to be extremely slow. 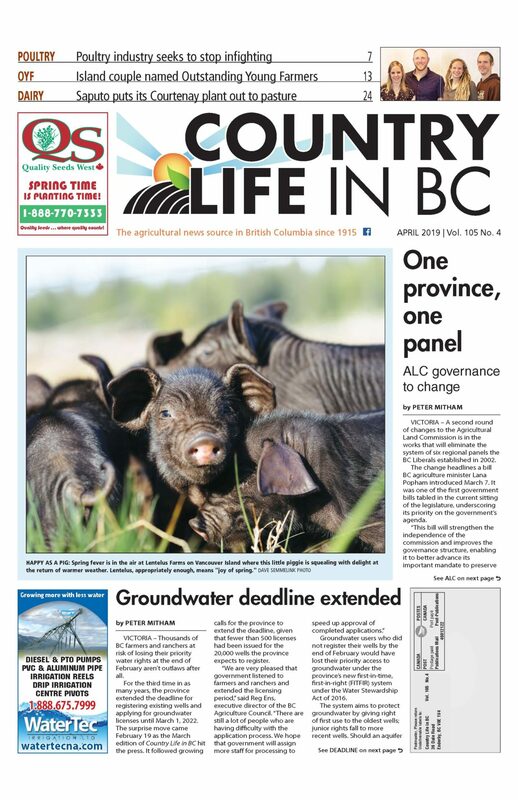 As of November 13, the province had received 2,644 licence applications from existing groundwater users but had only granted 278 licences, ministry communications director Vivian Thomas told Country Life in BC. However, Despault insisted this should not stop farmers from starting the process. “If you are an existing user, file your application and keep using your water,” she said. New users, however, need a licence before digging a new well. Despault said those applications are getting priority attention. She says the ministry has a new-use turnaround time of 140 days but the facts seem to belie that. Thomas notes the ministry has received 366 licence applications for new groundwater use but has only granted 100 of those licences.